Let us be happy, beloved brothers and sisters, that we belong to the Holy Orthodox Church, worthily and rightly glorifying the Most Holy Sovereign Theotokos on this eminent day out of all the days of the year with special solemnity. There exists on earth many societies and entire governments that do not consider the need nor the obligation to call upon and glorify the Queen of Heaven and earth, the Mother of our Divine Lord Jesus Christ, and other Saints and Angels; to submissively serve Her lovingly, as the True Mother of God. Sadly, nowadays we have heretics (among us) who actively dishonor the Mother of God, the Saints, their holy icons, their holy relics and their feast days. O, if only they also unanimously with us glorified the worthy Queen of Heaven and earth! 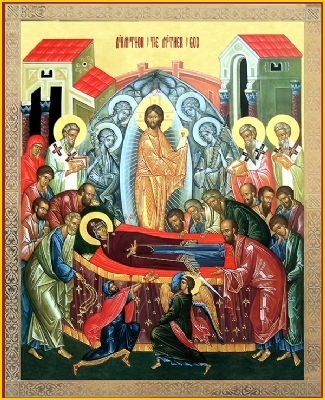 Today the Holy Church solemnly glorifies the Honorable Dormition (Koimisis) or Translation (Metastasis) of the Mother of God from earth to heaven. A wonderful Translation--she died without serious illness peacefully. Her soul is taken up in the Divine hands of Her Son and carried up into the heavenly abode, accompanied by the sweet singing of Angels. And then, her most pure body is transferred by the Apostles to Gethsemane where it is honorably buried, and on the third day it is resurrected and taken up to Heaven. You see this on the holy icon of the Dormition (Koimisis) of the Theotokos. On it is represented the Life-bearing body of the Theotokos laying on the bier, surrounded by the Holy Apostles and Hierarchs, and in the center of the holy icon the Lord holding in His hands the Most Pure soul of the Theotokos. The Translation (Metastasis) of the Mother of God is a paradigm of the translation in general of the souls of Christians to the other world. We say that our dead have "fallen asleep" or "passed away." What does this mean? This means that for the True Christian there is no death! Death was conquered by Christ on the Cross. But there is a translation, i.e., a rearrangement of his condition, i.e., his soul is in another place, in another age, in another world beyond the grave, eternal, without end, by the voice of the Lord and the fearful yet wonderful trumpet of the Archangel, all the dead shall live and come forth each to his place: "they that have done good, unto the resurrection of life, and they that have done evil, unto the resurrection of damnation" (St. John 5:29). This is what the Christian means by translation (metastasis). We should be ready for this translation, for the day of the General Resurrection and Judgment, for this indescribable world event, recorded in the Holy Scripture. This preparation for the meeting of the Heavenly King before the dread judgment seat, after death, is essentially the person's preparation throughout the whole of his life. This preparation means a change in all his thoughts, and the moral change of all his being, so that the whole man would be pure and white as snow, washing clean everything that defiles the body and spirit, so that he is adorned with every virtue: repentance, meekness, humility, gentleness, simplicity, chastity, mercifulness, abstention, spiritual contemplation, and burning love for god and neighbor. Our preparation for meeting the Heavenly King, and for the inheritance of eternal life in heaven, should consist of these things. The Heavenly King desires souls adorned with immutable virtue, souls prepared so that the very Lord Himself could abide in them. Do not marvel that the Very Lord wants to live in us. In fact, the human soul is more spacious than the heavens and the earth, for it, exists in the image of God. And if one removes sins from the soul, the Lord of all will settle in it and will fill it with Himself. "We will come to him and make Our dwelling" (Saint John 14:21), says the Lord about the souls who love Him. Please note. We, Orthodox Christians, must never attempt to dilute our Holy Orthodox Christian Faith and Tradition. We have a great responsibility to keep our Holy Orthodox Christian faith and Church as her Divine Founder our Lord and Savior Jesus Christ gave it to us. Saint Paul in his holy Epistle to the Ephesians writes: "Husbands, love your wives, just as Christ also loved the church and gave Himself for her, that He might sanctify and cleanse her with the washing of water by the word, that He might present her to Himself a glorious Church, not having spot or wrinkle or any such thing, but that she should be holy and without blemish" (Ephesians 5:25-27). Countless Christians, men, women, and children, have given their lives over the centuries to keep our Christian faith and Church "Holy and without blemish" and True to her Founder and her only Head. Do not ever be willing to compromise her purity and integrity so that you may be "inclusive" or "politically correct". There are always people, both within the Church and without, who are willing to prostitute the Church for personal wicked reasons. Be alert, be vigilant, and be willing to sacrifice your very lives for the Church of Christ and for Him. There are no liberals or conservatives in the One, Holy and Apostolic Church, the only Authentic Church of Christ. There are only True and obedient followers and believers of Christ who are willing to deny themselves and to take up their cross and follow Him to the Heavenly Kingdom and Eternal Life. Do not be fooled to think that there is no heresy today among Christians. As a matter of fact, there is more heresy today than ever in the history of Christianity. Heresy is evil and seeks to divide the Christians and to destroy the Church of Christ. Jesus, however, assures us when he says, "I will build my church, and the gates of Hades shall not prevail against it" (St. Matthew 16:18). Persecution of the Church has never ceased!